Sometimes it's great just to see a utility knife with sheer simplicity. Nothing fancy, no special little gimmicks. Just a straightforward machete made from quality materials. And it's made by none other than Cold Steel. The basic design of this Cold Steel machete is derived from ancient African and South American styles. It brings you back to a time when one simple knife had to perform a variety of adventuresome tasks such as slashing through the jungle, hunting for daily meals, or preparing for self defense against the unknown. 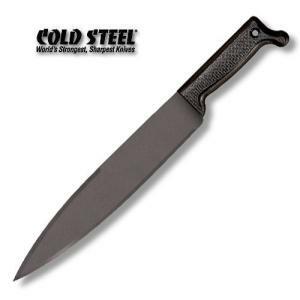 Its blade is made from hardened carbon steel, ground to razor-sharpness. The flat plain edge comes to a lengthy spear point at the tip. To keep this machete safe, a black Cordura sheath is included so that the edges won't dull from exposure, and keeps the knife attached to your belt as long as you like. This particular machete comes in two different lengths. The shorter model measures 17.625 inches overall with a 12-inch blade, and the longer version measures 23.625 inches overall with an 18-inch blade. Here's a closing tip: You'll see the machetes listed by blade length, not by overall length, so make sure you're aware of this before ordering; otherwise you might accidentally get the wrong size.